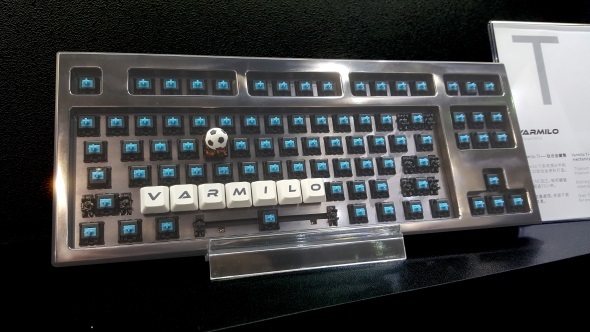 Chinese keyboard manufacturer, Varmilo, is on the show floor at the main Computex hall showing off its specially designed PUBG keyboard, the ‘Chicken Dinner.’ The company manufacturers all its own keyboards and so can change the keycap designs at the drop of an S1897 shotgun, and that means it can create some rather special alternatives. The ‘Chicken Dinner’ – apparently a love letter to all gamers – offers three different setups, from a compact TKL design, a standard 105-key layout, and a textured design with four extra keys. And for those PUBG gamers who can’t count up to ten, Varmilo has ditched the numbered keys in favour of weapon icons. Old board got you down? Check out our pick of the best gaming keyboards. You’ve also got a choice of eight different Cherry MX switches, so you are getting a quality mechanical keyboard behind all those iconic keycaps. There are the classic black, blue, brown, and red, and also red and black silent switches, as well as MX Clear and Speed options. We don’t know the price of the ‘Chicken Dinner’ yet, but you know the old adage: if you have to ask… you’re a fool with more money than aesthetic sense. But then if that description does fit you then Varmilo has got an even better keyboard for you, a $4,500 one. The Varmilo Ti is a titanium alloy keyboard, and I’m not just saying it’s been finished with titanium, or it has a few titanium highlights. No, the entire frame has been hewn from a single lump of titanium, with a separate titanium alloy plate for the switches and PCB. It’s the heaviest keyboard I’ve ever swung about in a crowded showfloor, and also possibly one of the most ugly too. 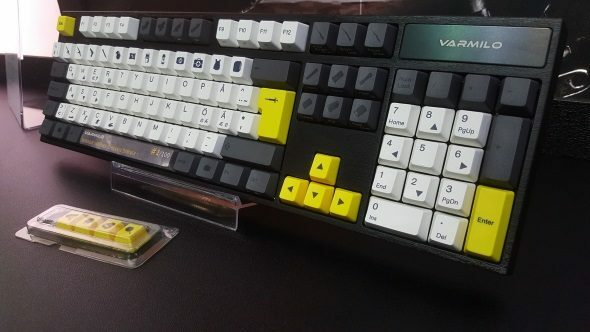 At least it doesn’t have PUBG keycaps on it, but I’m sure Varmilo would oblige if you were shelling out $4,500 on one. 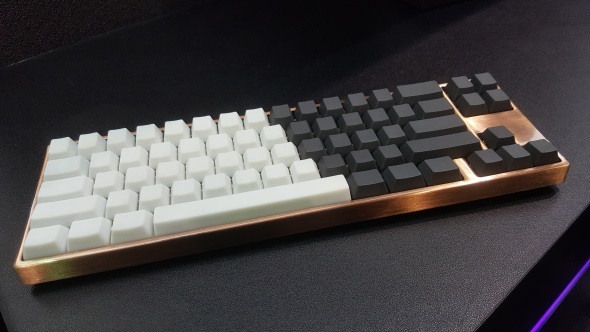 Though if that is a little too rich for your blood, but you still want a solid metal keyboard then Varmilo can still accommodate you with its zinc alloy mechanical switch keyboard. That’s 1.8kg of zinc-y board and only $300… a relative bargain I think you’ll agree.